Painting of Kūkai (774 - 835 C.E. Kūkai (空海), also known posthumously as Kōbō-Daishi (弘法大師), 774 – 835 C.E. : Japanese monk, scholar, and artist, founder of the Shingon or "True Word" school of Buddhism. The epitome of Kūkai's esoteric Buddhism asserted the theory of "life" as the anchor of Mahayana branch. Until Kūkai's time period, there had been no systematic theory in esoteric Buddhism; Kūkai formulated the theory and organized esoteric Buddhism for the first time. His religious writing, some 50 works, expounds the esoteric Shingon doctrine. The name "Kūkai" consists of two Kanji; Ku (means “sky”) and Kai (means “ocean”). As indicated by his name, Kūkai’s thought had a cosmic breadth and depth. He had many talents and left works on poetry, rhetoric, dictionary compilation, and philosophical literature. Kūkai was also one of three master calligraphers (see Shodo) in Japan and is said to have invented kana, the syllabary in which, in combination with Chinese characters (Kanji) the Japanese language is written. His religious writings, some 50 works, expound the esoteric Shingon doctrine. Kūkai is also said to have written the iroha, one of the most famous poems in Japanese, which uses every phonetic kana syllable in one poem. Kūkai substantiated Buddhist benevolence in public services such as establishing the first private school open to people of all ranks in Japan, and the construction of reservoirs. His spirit of service became the root of a number of legends; over 5,000 stories concerning Kūkai exist all over Japan. Some of the legendary places became pilgrimage sites, and pilgrimages there are still popular today. Kūkai is probably one of the most beloved and respected figures in Japanese history. Kūkai was born in 774 C.E. in the province of Sanuki on Shikoku island in the present day town of Zentsuji, Kagawa. His childhood name was “Mao” (means “True-fish” in Japanese). His family was a declining aristocratic family. At age fifteen, he began to receive instruction in the Chinese Classics under the guidance of his maternal uncle. In 791 C.E. Kūkai went to "the capital," (probably Nara), to study at the government university, the graduates of which were chosen for prestigious positions as bureaucrats. The Fujiwara clan became very powerful in government, and Kūkai’s prospects for a career as a bureaucrat dimmed. At some point Kūkai became disillusioned with the course of study at the university and went through a decisive transformation that led him to abandon his studies and become a wandering mendicant. During this period Kūkai frequently sought out isolated mountain regions where he chanted the Ākāsagarbha mantra relentlessly. But he also must have frequented the large monasteries of Nara. We know this because his first major literary work, Sangō shiiki (三教指歸; Indications of the Goals of the Three Teachings), composed during this period at the age of 24, quotes from a remarkable breadth of sources, including the classics of Confucianism, Taoism, and Buddhism. Indications gave the first hint of the way that Kūkai would transform Japanese society from the wholesale importation of Chinese culture toward the emergence of a truly Japanese culture. Kūkai was born in a period of political turmoil with Emperor Kammu (reigned 781-806 C.E.) seeking to consolidate his power and to extend his realm. In 784 C.E. Kammu shifted his capital from Nara to Nagaoka in a move that was said to be intended to edge the powerful Nara Buddhist establishments out of state politics Then, in 794 C.E. Kammu suddenly shifted the capital again, this time to Heian-kyō, which is modern day Kyoto. How Kūkai managed to be included on a government sponsored mission to China is uncertain, but he set sail in 804 C.E. In 805 Kūkai met Master Hui-kuo (Jap. Keika) (746 - 805), the man who would initiate him into the esoteric Buddhism tradition. Hui-kuo came from an illustrious lineage of Buddhist masters, famed especially for translating Sanskrit texts, including the Mahavairocana Sutra, into Chinese. Hui-kuo immediately bestowed on Kūkai the first level ''Abhisheka'', or esoteric, initiation. Kūkai had expected to spend 20 years in China studying, but in a few short months he was to receive the final initiation, and become a master of the esoteric lineage. This means that Kūkai must have mastered the complex rituals involving combinations and ''mudra'', ''mantra'', and visualisations associated with each of the deities in the two ''mandala'' (graphic representation of the world perceived by the enlightened individuals), amounting to several dozen distinct practices. Kūkai was the only one who received the entire teaching of both the Garbhakosha and the Vajradhatu mandalas. Hui-kuo also gave Kūkai a number of ritual implements and art works. Kūkai arrived back in Japan in 806 C.E. In Kūkai's absence, Emperor Kammu had died and been replaced by Emperor Heizei, who had no great enthusiasm for Buddhism. Saicho, the founder of the Tendai school, was a court favorite, and these two factors seemed to have contributed to the lack of interest shown by the court in Kūkai's return. Saicho had traveled to China at the same time, and he was also initiated into esoteric Buddhism (by Shun-hsiao), and had also returned with esoteric Buddhist texts. Indeed he can rightly claim priority in introducing esoteric Buddhism to Japan. Esoteric Buddhism became an important aspect of the Tendai school which was primarily focused on the Lotus Sutra, an esoteric text. Saicho had already had esoteric rites officially recognized by the court as an integral part of Tendai, and had already performed the abhisheka, or initiatory ritual, for the court by the time Kūkai returned to Japan. Kūkai was in quite a difficult position in that he was a relative unknown, up against the rising star of Saicho, in a field of opportunities strictly limited by draconian state control of religious practice. However with the demise of Emperor Kammu, Saicho's fortunes began to wane. But we know that he and Kūkai corresponded frequently and that Saicho was a frequent borrower of texts from Kūkai. Saicho also requested, in 812, that Kūkai give him the introductory initiation, which Kūkai agreed to do. Kūkai also bestowed a second level initiation on Saicho, but refused to grant the final initiation because Saicho had not completed the required studies. Their friendship could be said to end when Kūkai refused to lend him a scripture, saying that Saicho could not learn what he needed from a text, but only through a proper initiation into the teachings. We know little about Kūkai's movements until 809 C.E., when the court finally responded to Kūkai's report on his studies, which also contained an inventory of the texts and other objects he had brought with him, and a petition for state support to establish the new esoteric Buddhism in Japan. That document, the Catalogue of Imported Items is interesting because it is the first attempt by Kūkai to distinguish the new form of Buddhism from that already practiced in Japan. Late in 809 Kūkai finally received the court’s response, which was an order to reside in the Takaosanji temple (later Jingoji) Temple in the suburbs of Kyoto. This was to be Kūkai's headquarters for the next 14 years. The year 809 also saw the retirement of Heizei due to illness and the succession of Emperor Saga, who supported Kūkai. During the three-year period after his return from China, there was little that Kūkai could do, but he seems to have established himself as a calligrapher of note, for Saga often invited Kūkai to the palace where he would write letters on the Emperor's behalf. They also exchanged poems and other gifts. In 810 Kūkai emerged as a public figure when he was appointed administrative head at Tōdaiji Temple in Nara. Tōdaiji was the central temple in Nara and therefore the most important in the country. To get the appointment, Kūkai needed not only the support of the Emperor, but also of the powerful Nara clergy. Shortly after his enthronement Saga was seriously ill and while he was recovering Heizei fomented a rebellion, which had to be put down by force and resulted in much bloodshed on both sides. Eventually Saga won the day, but the political crisis, combined with his illness, made this a very difficult period. It seems that Kūkai was one of his mainstays at the time. In any case in 810 Kūkai petitioned the Emperor to allow him to carry out certain esoteric rituals that were said to "enable a king to vanquish the seven calamities, to maintain the four seasons in harmony, to protect the nation and family, and to give comfort to himself and others." His petition was granted. The emperor granted Mt. Kōya to Kūkai free from all state control. Kūkai's vision for Mt. Koya was that it become a representation of the two mandalas which form the basis of Shingon Buddhism, with the central plateau as the Womb Realm mandala, and the peaks surrounding the area as petals of a lotus; located in the centre of this would be the Diamond Realm mandala in the form of a Temple which he named ''Kongōbuji'' - the “Diamond Peak Temple.” At the centre of the Temple complex sits an enormous statue of Mahavairocana Buddha who is the personification of Ultimate Reality. When Kammu had moved the capital, he had not permitted the powerful Buddhists from the temples of Nara to follow him. He did commission two new temples: Toji (Eastern Temple) and Saiji (Western Temple) which flanked the road at southern entrance to the city that were intended to protect the capital from evil influences. 1n 824 Kūkai was appointed to the administrative body that oversaw all the Buddhist monasteries in Japan, the Soogoo, or Office of Priestly Affairs. The Office consisted of four positions, with the Supreme Priest being an honorary position that was often vacant. The effective head of the Sogo was the Senior Director (Daisoozu). Kūkai's appointment was to the position of junior director (Shoosoozu). In addition there was a Vinaya Master (Risshi) who was responsible for the monastic code of discipline. In 828 Kūkai opened his School of Arts and Sciences, Shugei shuchi-in, a private institution which was open to all regardless of social rank. Kūkai completed his magnum opus The Ten Stages of the Development of Mind in 830 C.E. A simplified summary, The Precious Key to the Secret Treasury followed soon after. In 831 he experienced the first signs of the illness that eventually killed him. He sought to retire but the emperor would not accept his resignation, and instead gave him sick leave. Towards the end of 832 Kūkai was back on Mt. Koya and spent most of his remaining life there. In 834 he petitioned the court to establish a Shingon chapel in the palace for the purpose of conducting rituals that would ensure the health of the state. This request was granted and Shingon ritual became incorporated into the official court calendar of events. In 835, just two months prior to his death, Kūkai was finally granted permission to annually ordain three Shingon monks at Mt. Koya. Legend has it that Kūkai has not died but entered into an eternal samadhi (or deeply concentrated meditation) and is still alive on Mt. Koya, awaiting the appearance of the next Buddha Maitreya. Kūkai came to be regarded as a Bodhisattva who had come to earth in order to bring relief from suffering to the time between Shakyamuni Buddha, and Maitreya, which is said to be characterized by increasing disorder and decay. Buddha identified desire as the cause of human suffering and sorrow, and saw the denial of physical desire through an ascetic life as the path to Nirvana (paradise; enlightened world). Hinayana Buddhism, which grew from this concept centering on celibate monks, presented a gloomy theory of salvation which did not appeal to lay people and could not be applied in their daily lives. Mahayana Buddhism arose in response, taking Buddha’s simple teachings and creating from them an elaborate system of metaphysics. From this current, esoteric Buddhism took shape, incorporating ideas from Hinduism. The earliest esoteric texts appeared in India around the fourth century C.E., and there is evidence that Nalanda University in northern India was a center for the early Tantric movement. By the thirteenth century, Buddhism had mostly died out in India, its practices merging with Hinduism, and both tantric religions were experiencing pressure from the rising importance of Islam. The majority of the tantric practices, with variations from the original Indian forms, had been adopted in Tibet, where they were preserved until recently. The central figure of esoteric Buddhism is Vairocana (also Vairochana or Mahavairocana; 大日如來 or 毘盧遮那佛). Gautama Buddha was a spiritual teacher in ancient India. The time of his birth and death are unclear, but most modern scholars have him living between approximately 563 B.C.E. and 483 B.C.E. According to tradition, he was born with the name Siddhartha Gautama and, after a quest for the truth, underwent a spiritual transformation and changed his name to Buddha. He is also commonly known as Shakyamuni. After a lapse of years, Buddhists started to think that this great teacher must have been, not only a historical figure, but also the enlightened Buddha in his previous life. Eventually the enlightened Buddha became dharma-kaaya Buddha. Nichiren later pointed out the contradiction between the historical figure of Buddha and the enlightened Buddha, asserting that only the dharma-kaaya Buddha (a transcendent, formless, and imageless body of Buddha) was the real Buddha. The Huayan (Avatamsaka Sutra) put forth a theory that dharma-kaaya was a being called vairocana. The thinkers of esoteric Buddhism took this viarocana and created a new Vairochana or Vahavairocana who transcended and separated from Buddha. This was in contradiction to the theory of the void (sunya, empty) put forth by Nāgārjuna (龍樹 in Chinese) (c. 150 - 250 C.E. ), a very important Indian Buddhist philosopher and the founder of the Madhyamaka (Middle Path) school of Mahāyāna Buddhism. The Sutras of esoteric Buddhism (大毘盧遮那成佛神變加持經 and 金剛頂経) only speak of Vairocana, never of Buddha. This is a denial of traditional Buddhism. Esoteric Buddhism was introduced to China by two Indian monks (善無畏 and 金剛智) in the eighth century C.E. Amoghavajra (705-774) (in Chinese 不空 Bukong/P'u-k'ung) was a prolific translator who became one of the most politically powerful Buddhist monks in Chinese history, acknowledged as one of the eight patriarchs of the doctrine in the Shingon lineages. Amoghavajra’s disciple was Hui-kou (恵果)（746－805 C.E., who became the mentor of Kūkai. Philosopher mystics of the Upanishads identify Brahman, the world soul, with atman, the inner essence of the human being, or the human soul, and say that Brahman and atman were originally the same. Buddhism in general denies God. Nāgārjuna (龍樹 )’s theory of the void (sunya, empty) denies the permanent reality of all beings including God, human beings, Buddhahood and all other beings. The world is an ephemeral ever-changing process. Through various Buddhist practices, the world can appear as purified (Pratītyasamutpāda, purified world) to the eyes of the enlightened. Esoteric Buddhism begins from this purified world. In Japanese Buddhism, Saicho and Kūkai had a different philosophical view of the world from the established Buddhism of Nara. They asserted that this world is not a vulgar and low place which should be completely denied, but encompasses a "purified world" evident to the eyes of the enlightened. The “theory of the purified world” depicted the world we live in as the “purified world.” The Huayan school of Nara Buddhism already had a theory of the purified world, but it had never been clearly recognized and accepted. The purified world was graphically and symbolically depicted as Mandala (Sanskrit mandala, or "circle"). The word is of Hindu origin, but is also used in a Buddhist context to refer to various tangible objects. Mandala has become a generic term for any plan, chart, or geometric pattern that represents the cosmos metaphysically or symbolically, a microcosm of the universe represented by visual images and symbols. Mandala was also understood as a sacred realm and the state of the realization of Buddha, which appears only to the perception of a fully enlightened person. Buddhism had taught that enlightenment was possible only through the eradication of all desire. This was so difficult to achieve that it could be done only through numerous lifetimes, and thus was a distant goal that Buddhist practitioners could only strive for. Kūkai believed that enlightenment could be achieved in one’s own lifetime, and that a perfect state of being could be realized with one’s own body. He taught that human nature was potentially perfect and an expression of Buddha-nature. He affirmed the Mahayana idea that all things and all beings are interrelated. In Attaining Enlightenment in This Very Existence, he explained how the six great elements (earth, water, wind, fire, space and consciousness) existed, interconnected, in an eternal state of harmony, and how therefore the body of the enlightened Buddha was one with the body of ordinary man. This concept of unity was expressed through various doctrines, including that of the pure mind, non-duality, and emptiness. Kūkai also taught that the transcendent body of Buddha manifests itself in all things and in natural phenomena. The highest truth of Buddha could be experienced not only through the natural world, but through art, poetry, music, calligraphy and language. In The Meanings of Sound, Word and Reality Kūkai put forth the theory that every spoken word has a corresponding reality, and every reality has a corresponding spoken word, or sound vibration. The reality of Buddha could be correlated to a wide variety of spoken sounds, called mantras. A mantra is a True Word (shingon) that denotes the reality of Buddha without distortion. Chanting a mantra articulates the reality of Buddha for the duration of the sound. 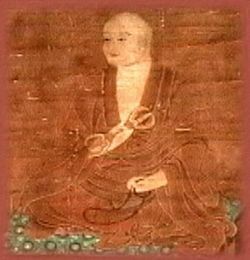 Sangō shiiki (三教指歸; Indications of the Goals of the Three Teachings), was an apology for Buddhism, written when he was 24 years old (797). Kūkai, in this work, compared Buddhism, Confucianism, and Taoism, and discussed the superiority of Buddhism. He used a form of literary narrative, displaying his literary talent. The work demonstrates Kūkai’s knowledge of existing belief systems, including Confucianism and Taoism. The Nara temples, with their extensive libraries, were the most likely place, perhaps the only place, where Kūkai could have found all of these texts. After returning from China in 806 Kūkai presented the court with a document, the Catalogue of Imported Items. It was a catalogue of documents and instruments that Kūkai brought with him from China. The catalogue included a number of esoteric Buddhist sutras. It showed Kūkai’s initial attempts at systematizing esoteric Buddhism. Kūkai wrote his greatest work, The Ten Stages of the Development of Mind, in 830. A simplified summary, The Precious Key to the Secret Treasury, followed soon afterwards. In these books he explained the ten stages of the mind of a Buddhist monk engaged in ascetic practices. The first stage is a mind which acts on instinct like a ram. The second stage is a mind that starts to think others, and to make offerings. The third stage is the mind of child or a calf that follows its mother. The fourth stage is a mind that can recognize physical and spiritual being, but still denies its own spiritual self. The fifth stage is a mind that recognizes the infinity of all things, eliminates ignorance and longs for Nirvana. The sixth stage is a mind that wants to take away peoples’ suffering and give them joy. The seventh stage is a mind that is the negation of all passing, coming and going, that meditates only on vanity and the void. The eighth stage is a mind that recognizes that all things are pure, the object and subject of the recognition were harmonized. The ninth stage is a mind that, like water, has no fixed boundaries, and is only rippled on the surface by a breeze. Similarly, the world of enlightenment has also no clear edge. The tenth stage is the state of realizing the height of the void (sunya, empty) and the Buddhahood; spiritual enlightenment. The first through the third stages signify the level of people in general. The fourth and fifth stages represent Hinayana (Theravada, lesser Vehicle) Buddhists. The fourth stage is that of enlightenment through learning Buddha’s words, Zraavaka. The fifth stage is that of self-enlightenment, Pratyekabuddha. The sixth stage indicates the Dharma-character school (Chinese: 法相宗) or Consciousness-only school (Chinese 唯識). The seventh stage represents Sanlun (Traditional Chinese: 三論) or, literally, the Three Treatise School, a Chinese school of Buddhism based upon the Indian Madhyamaka tradition, founded by Nagarjuna. The eighth stage represented Tendai (Japanese: 天台宗, a Japanese school of Mahayana Buddhism) descended from the Chinese Tiantai or Lotus Sutra School. The ninth stage represents Kegon (華厳) a name for the Japanese version of the Huayan School of Chinese Buddhism, brought to Japan via the Korean Hwaeom tradition. The tenth stage represents Shingon (真言), also called Japanese Esoteric Buddhism, a major school of Japanese Buddhism, and one of two major sub-schools of Vajrayana Buddhism, the other being Tibetan Buddhism. The word Shingon is a Japanese pronunciation of the Chinese term Zhen Yan meaning "True Word,” which itself is a representation of the Sanskrit word for ''mantra''. It is worth noting that in The Ten Stages of the Development of Mind, Kūkai placed Kegon (華厳) or the Huayan school, at a higher stage than the Tendai (Japanese: 天台宗), or Tiantai, or Lotus Sutra school. Tiantai (天台宗, Wade-Giles: T'ien T'ai), also called the Lotus Sutra School, was founded by Zhiyi (智顗, Wade-Giles: Chih-I) (538-597). Zhiyi (Chihi) organized sutras in five stages in a chronological order and selected the Lotus Sutra as the primary text of the Buddha. Nichiren and Saicho followed Zhiyi's interpretation. Kūkai not only challenged Zhiyi's interpretation but also asserted that Shingon (真言), also called Japanese Esoteric Buddhism, was superior to Tiantai and Kegon, because Kūkai thought that Shingon (真言) had the possibility of constructing a system of knowledge concerning “the purified world.” During the Japanese modern era (Meiji), this theory of The Ten Stages of the Development of Mind made many contributions to modernizing Japanese Buddhism. Kūkai’s other works include: ten volume collections of poems (Shoryo shu) edited by his disciple Shinzei, which also includes Kūkai’s words on his thought, friendships, rituals, and other subjects; a work on rhetoric (Bukyo hifuron); and the first Kanji dictionary in Japan (Tenrei bansyogi). Kūkai established a unique style of calligraphy and he was known as one of three master calligraphers in Japan, the other two being Tachibana Hayanari, and Emperor Saga. Kūkai’s preoccupation with life on the earth and his concern for people led him to initiate a variety of public services. He established the first private school open to people of all ranks in Japanese history, and constructed a reservoir (“Manno Ike” in Shikoku prefecture). His spirit of public service became the root of a number of legends all over Japan and he probably has more legends told about him than any other individual in the history of Japan. These legends are often associated with the discovery of water and hot springs. A number of places associated with Kūkai became sites for pilgrimage sites, and pilgrimages there are still popular today. Each pilgrim wears a shawl with the words, “Two of us are walking together” (Dogyo ninin), implying that the pilgrim is traveling with Kūkai. Kūkai’s efforts to realizing Buddha’s benevolence, as service to the people, seems to have made him tremendously popular among people all over Japan. Abé, Ryuichi. 2000. The Weaving of Mantra: Kūkai and the Construction of Esoteric Buddhist Discourse. Columbia University Press. Center for Buddhist Translation, Two Esoteric Sutras transl. by Rolf W. Giebel. University of Hawaii Press, 2001. Hakeda, Yoshito S. 1984. Kūkai and His Major Works. Columbia University Press. Koyasan Reihokan Museum, Sacred Treasures of Mount Koya: The Art of Japanese Shingon Buddhism. University of Hawaii Press, 2002. Kūkai, Tantric Poetry of Kūkai transl. by Morgan Gibson. White Pine Press, 1985. Numata Center for Buddhist Translation. Shingon Texts. Center for Buddhist Translation & Research, 2004. Payne, Richard Karl. Tantric Ritual of Japan; Feeding the Gods—The Shingon Fire Ritual, 2 edition, International Academy of Indian Culture and Aditya Prakashan, 1991. Shaner, David Edward. The Bodymind Experience in Japanese Buddhism: A Phenomenolgical Perspective of Kūkai and Dogen. State University of New York Press, 1985. Shiba, Ryotaro. Kūkai the Universal: Scenes from His Life. ICG Muse, 2003. Skilton, A. 1994. A Concise History of Buddhism. Birmingham: Windhorse Publications. Unno, Mark. Shingon Refractions : Myoe and the Mantra of Light. Explore Wisdom Publications, 2004. This page was last modified on 27 June 2014, at 21:45.